On the morning of the accident, an annual inspection had been completed on the airplane. After picking up the airplane from his maintenance provider, the pilot preflighted the airplane and then departed. The takeoff and climb were uneventful; however, during the cruise portion of the flight, a total loss of engine power occurred. 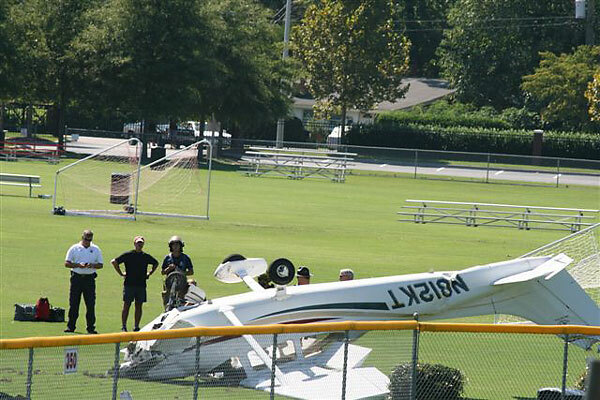 The pilot initiated an emergency descent and landed the airplane in a field that was used for sporting events. During the landing roll, the nose landing gear wheel dug into the ground, and the airplane nosed over. Examination of the fuel system revealed the presence of water in the fuel selector valve and the electric fuel boost pump discharge line. The pilot advised that the last time that he had added fuel to the airplane was 16 days before the accident flight. When he would park the airplane in the hangar at his home airport, he would not top off the fuel tanks, and the airplane would sit with approximately 30 gallons of fuel in the tanks. When asked if he had drained the sumps of the airplane during the preflight inspection prior to the accident flight, he advised that he did not because he was in a hurry. A total loss of power due to water contamination in the fuel. 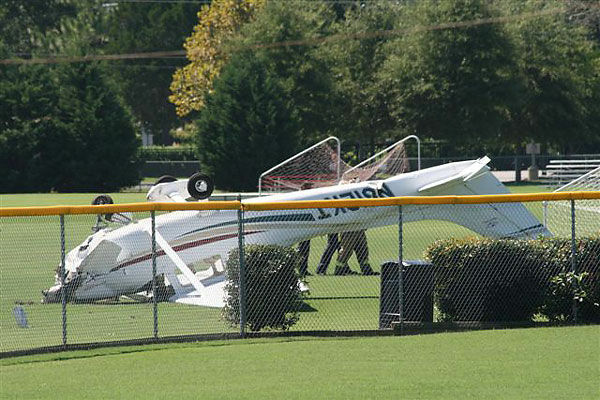 Contributing to the accident was the pilot's inadequate preflight inspection. According to the pilot, the airplane had completed an "owner assisted" annual inspection on the morning of the accident flight. During the annual inspection the No. 3 cylinder head had been replaced. Prior to departure from FDK, the airframe and powerplant mechanic who had conducted the annual had "runup" the airplane and no anomalies were noted and he released the airplane to the owner at approximately 1130. The pilot departed FDK for MQI at approximately 1201. He did not "top off" the fuel prior to his departure as he had checked the "usable fuel on his "FS-450 fuel scan," and noted that he had 40 gallons and that his flight to MQI would only require 27 gallons. Once he had climbed up to 8,000 feet above mean sea level (msl), and entered cruise flight, he alternated his power setting between 2100 to 2450 rpm every 20 to 30 minutes to break in the new cylinder. During the flight, the pilot also closely monitoring the cylinder head temperature and exhaust gas temperature of the No. 3 cylinder and ran it at richer fuel/air mixture than he normally did. After approximately 1 hour and 20 minutes of flight (26 minutes from MQI) however, the "engine stopped." He checked to see that both magnetos were "on" and declared an emergency with air traffic control. He attempted to glide in for a landing at Oceana Naval Air Station (NTU), Virginia Beach, Virginia, but realized that he had a headwind and could not make it to NTU. He then spotted a "sports field" off his left side and decided to land there. He turned off the fuel, the magnetos, and master switch. Upon touchdown, the nose wheel dug into the ground and the airplane nosed over, substantially damaging the airplane. According to Federal Aviation Administration (FAA) records, the pilot held a private pilot certificate with ratings for airplane single-engine-land, and instrument airplane. He reported a total flight time of 1,347 flight hours, with 1,337 hours in single-engine airplanes, and 912 hours in the accident airplane make and model. His most recent FAA third-class medical certificate was issued on September 23, 2008. The accident airplane was a four seat, high wing airplane of conventional construction with fixed tricycle landing gear. According to FAA records it was manufactured in 1978. It had been modified from its original configuration under an FAA approved supplemental type certificate with a high lift canard and the installation of a Continental 260 horsepower IO-470-F engine. According to maintenance records, the most recent annual inspection was completed on the day of the accident. At the time of the inspection, the airplane had accrued 1,033.9 total hours of operation. A weather observation taken 26 minutes after the accident, at NTU, included: winds from 220 degrees at 6 knots, gusting to 17 knots, visibility 10 miles, scattered clouds at 7,500 feet, temperature 28 degrees Celsius, dew point 13 degrees Celsius, and an altimeter setting of 29.79 inches of mercury. The airplane was not equipped with nor was it required to be equipped with a flight data recorder. It was equipped however with an electronic data monitoring system and global positioning system both of which contained non volatile memory and had captured data from the accident flight. Examination of the data recorded during the accident flight indicated that the airplane had been in cruise when a reduction in engine rpm occurred at 13:24:12. Prior to the reduction of engine rpm, oil pressure, oil temperature, manifold pressure, and exhaust gas temperature indicated a steady state condition with no anomalies noted. Examination of the accident site by FAA inspectors revealed three 300 foot long ruts which corresponded to the width of the landing gear of the airplane, and which led up to the location where the airplane had come to rest in an inverted position. Examination of the airplane revealed that it was substantially damaged. The top of the vertical stabilizer was crushed. The aft fuselage exhibited multiple deformations and crush and compression damage, and was bent approximately 10 degrees down and to the right of the centerline of the airplane. The right wing exhibited wrinkling of the upper surface, and the right lift strut was bent. The nose landing gear assembly was collapsed rearward, the spinner was crushed, the lower cowling was bent and crushed, and one propeller blade was bent aft. The right canard was also bent aft, and the right wheel pant was broken and separated from its mounting location. Examination of the engine revealed no evidence of any preimpact mechanical malfunction. Both magnetos were functional and the spark plugs which appeared clean and gapped correctly would fire when the drive train was rotated by hand. Drive train continuity was confirmed and thumb compression was present on all cylinders. Oil was also present in the galleries and rocker boxes. Examination of the fuel system by NTSB investigators revealed that the fuel system would hold a total of 92 gallons of aviation fuel. The cap seals had been replaced in 2001 and were clean and in like new condition. The electric boost pump, and engine driven fuel pump were both functional. Further examination revealed however, the presence of a clear liquid in the fuel selector valve, and in the fuel discharge line from the electric fuel pump. Approximately 16 fluid ounces of this clear liquid was recovered. When the clear liquid was applied to a coupon containing water finding paste the paste changed color indicating the presence of water. According to the manufacturer's Pilot Safety and Warning Supplements, Section 10 (Fuel System Contamination), regarding proper preflight of the fuel system, a full preflight inspection was recommended before each flight. Inspection procedures for the fuel system must include checking the quantity of fuel on level ground, checking the security of the fuel filler caps, and draining the fuel tank sumps, fuel reservoir(s) fuel line drain(s), fuel selector drains, and fuel strainer(s). To ensure that no unsampled fuel remains in the airplane an adequate sample of fuel from the fuel strainer must be taken with the fuel selector valve placed in each of its positions (Both, Left, Right, etc.). Some Cessna airplanes are equipped with a fuel reservoir(s) and its drain plug or quick drain. The fuel reservoir(s) on most single engine airplanes are located near the fuel system low point where water will accumulate. Therefore, the fuel reservoir(s) must be drained routinely during each preflight inspection. The condition of the fuel filler cap seals, pawls, and springs should also be periodically checked for evidence of wear and/or deterioration which indicates a need for replacement. The fuel cap adapters and seals should also be checked to insure that the sealing surfaces are clean and not rusted or pitted. Deformed pawls may affect the sealing capabilities of the seals and/or cause them to be exposed to detrimental weather elements. Precaution should be taken to prevent water entry into fuel tanks, due to damaged filler caps and every effort made to check and remove all water throughout the fuel system. Umbrella caps also will assist in preventing water entry into the fuel tank through the fuel filter. The manufacturer also advised that it is the pilot's responsibility to ensure that the airplane was properly serviced before each flight with the correct type of fuel. The pilot must take the time to inspect the airplane thoroughly, making sure all of the fuel filler caps are installed and secured properly after visually checking the fuel quantity with the airplane on level ground. During the check of the fuel tanks, they should observe the color and odor of the fuel while draining a generous sample from each sump and drain point into a transparent container and check for presence of water, dirt, rust, or other contaminants. Additionally, the manufacturer's guidance regarding proper sampling from quick drains advised that the fuel system sumps and drains should always be drained and checked for contaminants after each refueling, and during each preflight inspection. At least a cupful of fuel should be drained into a clear container to check for solid and/or liquid contaminants, and proper fuel grade. If contamination was observed, to take further samples at all drain points until the fuel is clear of contaminants; then to gently rock the wings and, if possible lower the tail to move additional contaminants to the sampling points. Repeated samples should then be taken from all of the drain points until all of the contamination has been removed. If excessive sampling was required, then the airplane should be completely defueled, drained, and cleaned, and an attempt made to discover where or how the contamination originated before the airplane flies again. According to FAA Special Airworthiness Information Bulletin (SAIB) CE-10-40R1, Aircraft Fuel System; Water contamination of Fuel Tank Systems on Cessna Single Engine Airplanes; Water may enter the fuel system via any penetration in the wing fuel tank, or may come out of solution. In addition to the precautions that were published in the manufacturer's Pilot Safety and Warning Supplements (which were also referenced in the SAIB), the SAIB also cautioned pilots to take precautions to preclude water migration in the fuel tank system from an internal source (free water coming out of solution) by keeping the fuel tanks full when the airplane is not operated regularly, and by keeping the fuel tanks full between flights. On October 19, 2010, the pilot was re-interviewed by the NTSB. 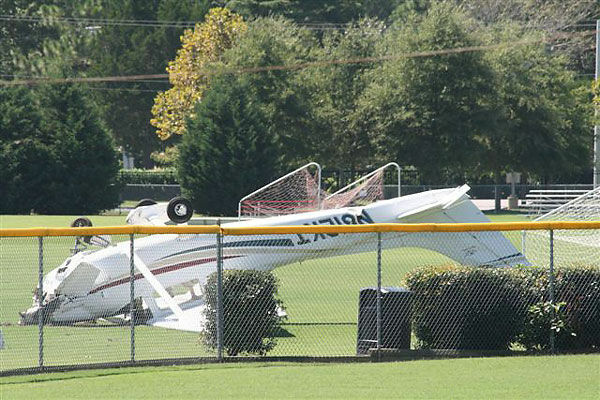 During the interview the pilot stated that the last time he had refueled prior to the accident flight was on August 20. 2010, at MQI. The airplane usually had about 30 gallons of gas in it. He would not top it off prior to parking it at FDK. He had done one of those "wing rock things" a couple of weeks before and that the last time he remembered sumping the airplane he had used his "small sump" tool and did not use his "large one". He also stated that he did not sump the airplane before he took off on the accident flight as he was "in a hurry". 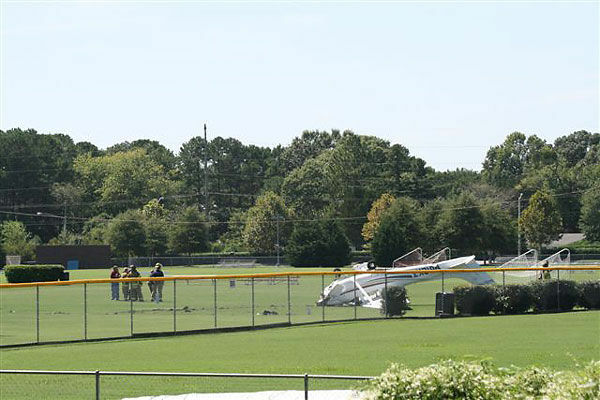 VIRGINIA BEACH - A Maryland pilot failed to adequately inspect his fuel system prior to a flight that ended with his Cessna overturned on an athletic field at Cape Henry Collegiate School in Virginia Beach in 2010, the National Transportation Safety Board has ruled. The probable cause of the crash landing was a loss of power due to water contamination in the fuel, according to the report on the NTSB website. 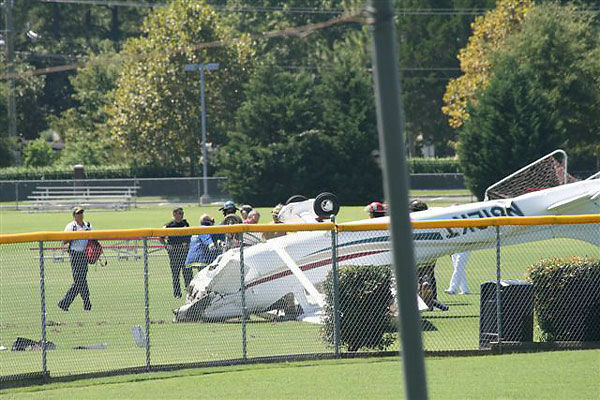 The pilot, who didn't suffer serious injuries, was on his way to Manteo, N.C. After he picked up the Cessna 182Q following its annual inspection, he "preflighted" the plane and had a smooth takeoff and climb, the report says. 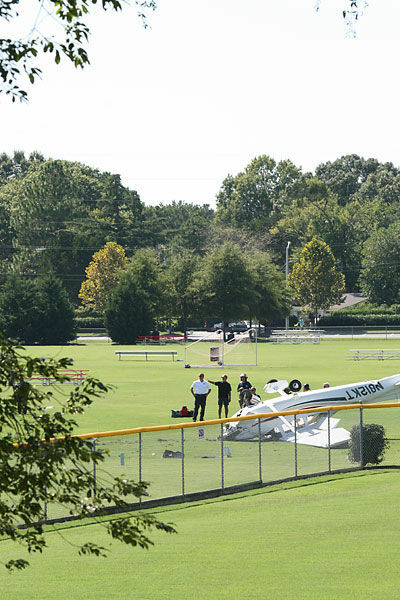 As the aircraft cruised southward, it lost power, and it flipped over when the pilot landed it on the school's field. The pilot told investigators he fueled the plane 16 days before the crash. The report says he was in a hurry and did not drain the sumps of the airplane during his preflight inspection that day. 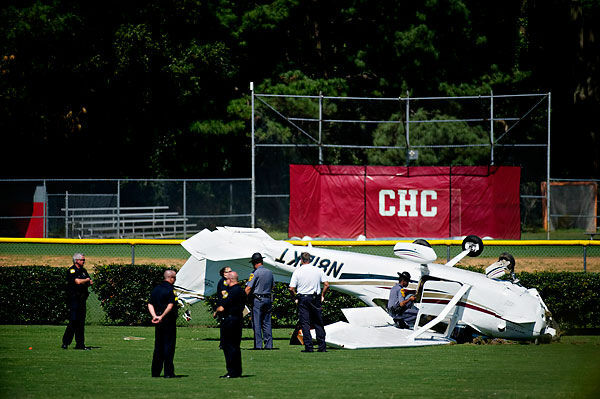 VIRGINIA BEACH - The pilot of a single-engine airplane who was on his way to Dare County made an emergency landing and overturned on a baseball field at Cape Henry Collegiate School on Saturday. "Apparently, he was trying to make it to Oceana and decided to put it down on the field," said Battalion Chief Kenneth Pravetz of the Fire Department. 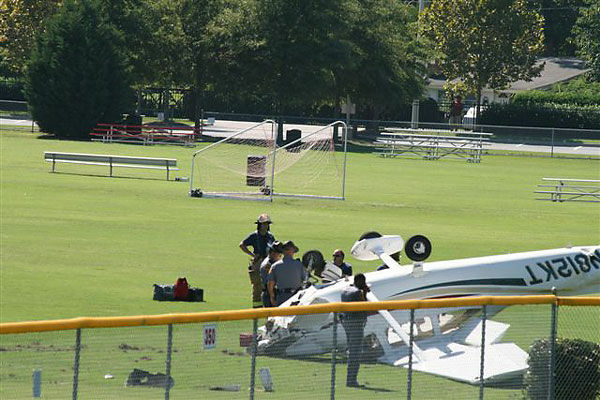 The Cessna, registered to an Ellicott City, Md., man, came down about 1:45 p.m. in the athletic field at the school in the 1300 block of Mill Dam Road. Cape Henry Collegiate is next to First Colonial High School. The pilot was flying from Bethesda, Md. Pravetz said the pilot told firefighters he was not hurt and was checked on the scene. Pravetz said the name of the pilot had not been released as of 7 p.m. Saturday, and the pilot was not a local. State police are investigating and the pilot is not being charged, Pravetz said. Anthony Checchio, 25, said he was playing tennis at First Colonial High when he saw the plane flying "extremely low." "It really didn't have a sound," he said. "It just came out of nowhere." 1) Get always a standard briefing, even for a local flight. 2) Always follow the checklists with the paper in hand. 3) Always stick your tanks. 4) Alaways sump your tanks. Those FIVE things will always guarantee a your LIFE when flying and will keep GA's image intact. There are no guarantees but those certainly help.